"Wisconsin has a right to be proud of its pioneer work in all phases of broadcasting, including its pioneering in program building as well as the scientific development of the art." So spoke C. M. JANSKY, Jr., at the ceremony dedicating an historical marker commemorating the establishment of 9XM-WHA, "the oldest station in the nation" at the University of Wisconsin. Mr. Jansky, as a student at the University, participated in the early wireless experimentation and is now an internationally famous radio electronics engineer in Washington D. C. For more than 40 years he has been actively associated with broadcasting. He speaks with authority from personal knowledge. 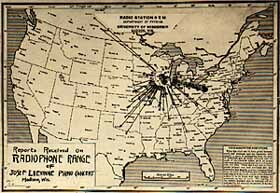 When Mr. Jansky was asked about the facts in the WHA "oldest station" claim, he remarked, "Not only do I think this is correct in respect to WHA; but since it is well recognized that regular broadcasting started in the United States, WHA may also be credited with being the oldest broadcasting station in the world." To the inspiring leadership of a great teacher, the late Professor EARLE M. TERRY of the Physics Department, Mr. Jansky gave the credit for laying Wisconsin's radio groundwork. "Except for him," said Jansky, "there would have been no early experimentations in radio telephony at the University. Except for him WHA could not be called the nation's oldest broadcast station. Except for him there might well be no WHA at all." Professor Terry, the scientist, was a man of social vision. He sensed some of the potentialities of "the wireless telephone" as an instrument of education, and stimulated the interest of individuals in other departments in providing programs. When pleading with somewhat apathetic colleagues for support for the broadcasting activity he ventured the prediction that the day would come when "wireless receivers will be as common as bathtubs in Wisconsin homes." Through the perseverance of the professor and his students, experimental station 9XM in 1917 was able to put into the air "successful" transmission of voice and music. The transmitter, including the vacuum tubes it used, was built by hand in the laboratory. One by one, vexing problems were solved. During World War I, as a participant in two-way wireless communication with the U. S. Navy, 9XM moved forward when other stations were silenced by government order. 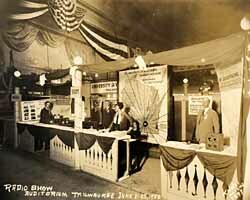 By 1919 a regular schedule of broadcasting was maintained. Following the war, in the early '20's broadcasting caught the fancy of the American public. It was predicted that it would become a universal source of educational opportunity. Many colleges and universities set up their own stations. In the early days the acquiring of a wireless receiving set was a do-it-yourself matter. Component parts were selected from counter stock in radio shops, and following a hook-up diagram, the receiver was assembled. Then, sensing the demand, electronic companies sold "ready-made" receivers. To stimulate receiver sales some of these companies set up transmitting stations to provide programs for the receivers they sold. Then came the discovery. The broadcasts could be used to sell receiving sets. And they could sell other products, too--gasoline, maps, socks, and candy. Many institutions sold or lost their stations to commercial operators. The rush was on, and it led to the establishment of the world's most extensive broadcasting service. In the United States today a home without a radio receiver is a rarity, and some 4,000 AM and FM broadcast stations bombard the airways. The Wisconsin State Broadcasting Service, as exemplified by WHA, is not typical of American radio. Though it is different, and is studied by visitors from other states and nations, it is largely taken for granted by Wisconsin citizens. It has become the most readily accessible source of educational opportunities to the people of the state. The educational impact of WHA, and its affiliated State Radio Council FM network stations which relay the programs, was appraised by President CONRAD A. ELVEHJEM, of the University of Wisconsin, at the WHA marker dedication ceremony. The basic policy underlying its development, he said, "has been sound and will provide the right direction for future utilization of radio and television in education generally." The philosophy reflected in the broadcasting service is that of the University itself--the boundaries of the campus are the boundaries of the state! For about 80 hours each week lectures, courses, discussions, news interpretations, school programs, crop and weather reports, farm and home information, readings, fine music, and specialized service programs of various kinds go out over the airways to homes in every county of the state. "Our current pattern," said President Elvehjem, "is the most effective one, since it provides unity of direction, solid educational standing, and freedom of operations hard to achieve in any other setting. "WHA has held firm to its basic purpose: education. It has not gilded the lily. It has sought to present education in an attractive form, and has succeeded. Education can be entertaining; but entertainment is seldom educational. WHA has managed to locate the fine line of distinction in this respect and has operated well within the educational side of this line. There is a real temptation, in this age of mass communication, listener counts, and hidden persuaders, to seek the broadest possible audience with sugar-coated messages. WHA has held aloof from these temptations, insisting always in quality offerings, knowing that while there is sugar enough on the airwaves to satisfy anyone's sweet tooth, the meat of education is hard to come by on most channels," concluded the president. The 9XM-WHA marker now stands on the Campus near Radio Hall. While it pays tribute to Professor Terry it also honors the thousands of other persons who through the years have believed in the mission of the station and have helped it along its often rugged way. Engineers, technicians, professors, teachers, students, administrators, state officials, legislators, broadcasters--and the listeners--all have had their roles in establishing, preserving, and developing for Wisconsin "the oldest station in the nation." Engel, Harold A. "The Wisconsin Idea--In Broadcasting." Wisconsin Academy Review 6 (1959). 16-19.